With the rapid development of wireless communication and mobile computing technologies and global positioning and navigational systems, spatial trajectory data has been mounting up, calling for systematic research and development of new computing technologies for storage, preprocessing, retrieving, and mining of trajectory data and exploring its broad applications. Thus, computing with spatial trajectories becomes an increasingly important research theme. 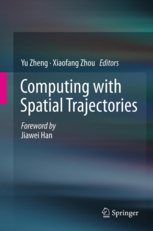 We chose 17 active researchers in the field of computing with spatial trajectories to contribute chapters to this book in their areas of expertise. 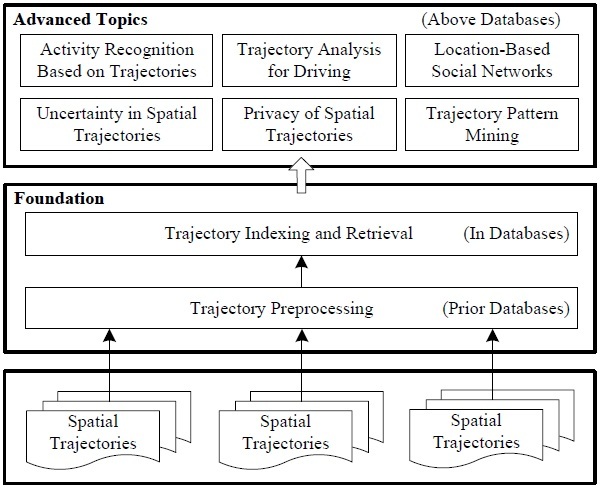 These chapters are organized according to the paradigm of “trajectory preprocessing (prior databases)–> trajectory indexing and retrieval (in databases) –> advanced topics (above databases),” as illustrated in the following Figure. Specifically, the book gradually introduces the concepts and technologies for solving the problems that newcomers will be faced with when exploring this field, starting from the preprocessing and managing of spatial trajectories, then to mining uncertainty, privacy, and patterns of trajectories, and finally ending with some advanced applications based on spatial trajectories including activity recognition, driving, and location-based social networks.